When we launched Sway Preview, our first priority was ensuring anybody could use the rich Sway web experience in any modern browser, regardless of whether you’re on a PC, Mac or tablet. That way, the broadest amount of people could use Sway to quickly create and share polished, interactive reports, presentations, personal stories and more. Every day, people also use native apps to get stuff done on their tablets, phones and other devices. Office has spent the last year bringing productivity applications like Word, Excel, PowerPoint, Outlook and OneNote to all major devices and platforms. Sway for iPhone is already available, and we’ve heard your feedback loud and clear that you’re eager for Sway apps on more devices and platforms. 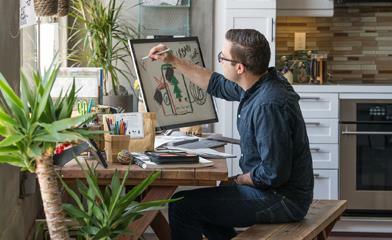 So today, we’re excited to share more news and a roadmap for Sway apps. Windows 10 is coming July 29, and it’s going to be a great time for millions (billions!) of people upgrading to a more personal computing experience. We will deliver a Sway native app experience for Windows 10 later this summer and we couldn’t be more excited. Sway for Windows will deliver a rich, touch-first experience that syncs your Sways across your devices and the web, helping you quickly create and share Sways that look great on any screen, for anyone you share with. Just as with Windows 10, Sway’s initial release on Windows 10 will be for PC and tablets. Reserve your free upgrade to Windows 10 (if you haven’t already), so you’re ready when Sway for Windows becomes available this summer! Sway for Windows 10 is coming this summer. Today we’re also excited to announce that Sway for iPad is now available, as is an updated version of Sway for iPhone. Building on your feedback, it is now easier than ever to add pictures, videos and text to your Sway. Previewing your creations is also quicker than before—simply switch between Edit and Preview at the top to see the polished and cohesive design taking shape as you create. Sway for iPad is optimized for the larger screen. It allows you to create, view and share Sways in landscape and portrait mode and also includes a few additional capabilities, such as the Remix! button for quickly trying out different layouts and styles. Now is a perfect time to download or update Sway for iPhone and iPad from the App Store today! 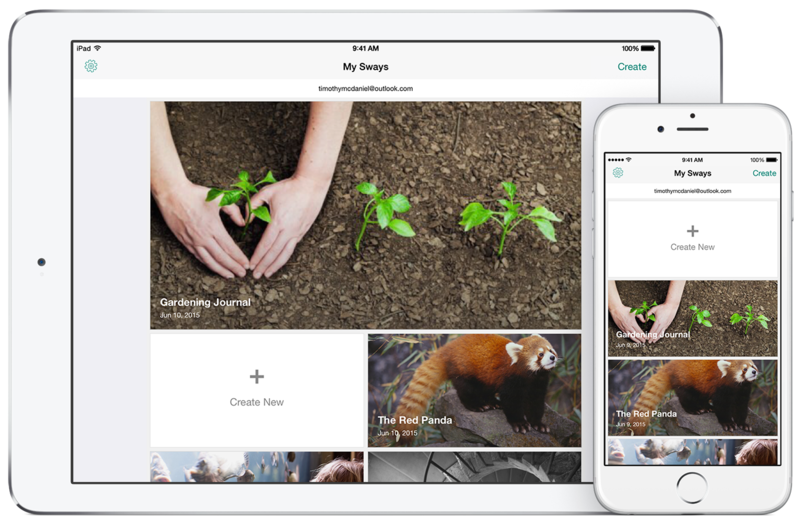 Sway for iPad is now available, along with an updated version of Sway for iPhone. 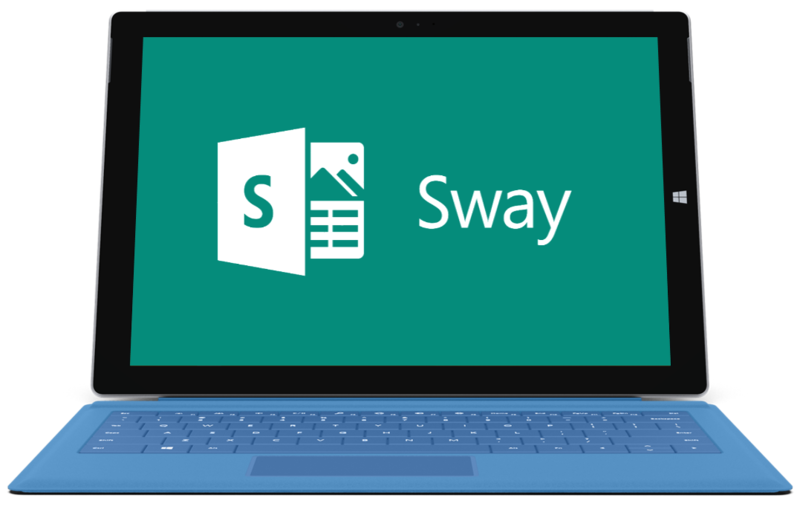 Last month, Sway for Office 365 began rolling out to qualified Office 365 business and education customers. That rollout began with support just in Sway on the web for Office 365 work and school credentials. Today’s releases of Sway for iPhone and iPad now support these accounts as well! You can log in to Sway for iPhone and iPad using the simplified sign in interface just like in Sway on the web, or Sway can automatically log you in using the same account credentials if you’re already signed into Word, Excel, PowerPoint or OneNote on your iPhone or iPad. As outlined previously, Sway for Office 365 is still available to First Release customers initially, and it will become available to all eligible Office 365 customers over the coming months. Last month, we also announced that Sway on the web had added support for six more languages, which has since grown to include Japanese as well. With today’s releases, Sway for iPhone and iPad now support these languages too, for both consumers and Office 365 business and education users. Now you can use the Sway interface in Dutch, French, German, Italian, Japanese, Portuguese and Spanish (in addition to English). Sway for iPhone and iPad are also now available in the App Store for 43 new markets where those are official languages. * More languages are on the way! 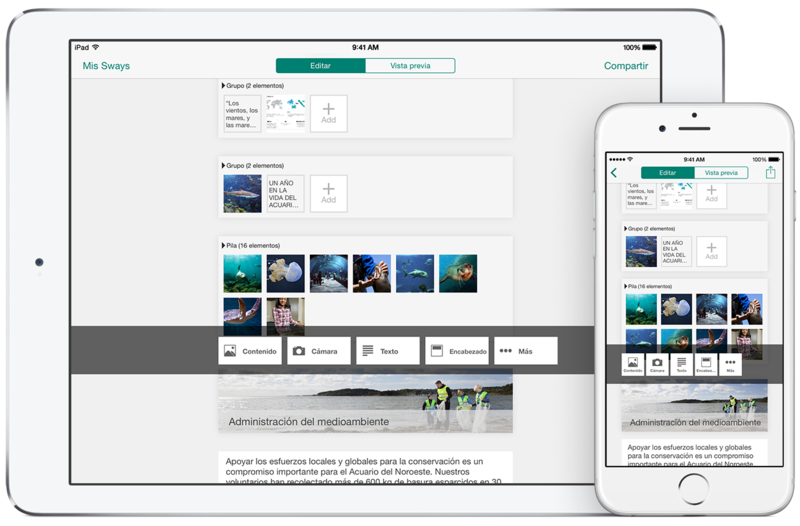 Sway for iPhone and iPad now support seven more languages and are available in new markets. With Sway apps coming to more devices and more platforms, including Windows, even more people will be able to create and share their interactive reports, presentations, personal stories and more with their devices while on the go, and in new ways. As always, let us know what you think on UserVoice! *Sway for iPhone and iPad are now available in: Angola, Antigua and Barbuda, Argentina, Australia, Austria, Bahamas, Barbados, Belgium, Belize, Benin, Bolivia, Botswana, Brazil, Burkina Faso, Canada, Cape Verde, Cayman Islands, Chad, Chile, Columbia, Republic of Congo, Costa Rica, Dominica, Dominican Republic, Ecuador, El Salvador, Federated States of Micronesia, Fiji, France, Gambia, Germany, Ghana, Grenada, Guatemala, Guinea-Bissau, Guyana, Honduras, Hong Kong, India, Ireland, Italy, Jamaica, Japan, Kenya, Liberia, Luxembourg, Madagascar, Malawi, Mali, Malta, Mauritius, Mexico, Mozambique, Namibia, Netherlands, New Zealand, Nicaragua, Niger, Nigeria, Pakistan, Palau, Panama, Papua New Guinea, Paraguay, Peru, Philippines, Portugal, Saint Kitts and Nevis, Saint Lucia, Saint Vincent and The Grenadines, São Tomé and Príncipe, Senegal, Seychelles, Sierra Leone, Singapore, Solomon Islands, South Africa, Spain, Suriname, Swaziland, Switzerland, United Republic of Tanzania, Trinidad and Tobago, Uganda, United Kingdom, United States, Uruguay, Venezuela, and the British Virgin Islands.